Star Stuff: Carl Sagan and the Mysteries of the Cosmos is an engaging picture book biography that will inspire young readers to ask "why" and "how" as they wonder about the universe. 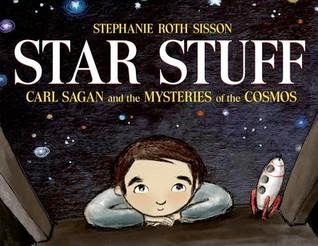 Stephanie Roth Sisson writes in a narrative style and uses comic-style illustrations and speech bubbles to describe the life and accomplishments of astronomer, Sagan. As a child, Carl Sagan visited the 1939 World's Fair where he saw time capsules and mechanical men. His inquisitive nature and passion for learning led him to the library where he read books about stars, planets and the solar system. As young Carl Sagan reads about the solar system in the library, the layout of the picture book changes from horizontal to vertical with a fold-out page depicting the sun. The book's title refers to Sagan's theory that "stars made the ingredients of life." 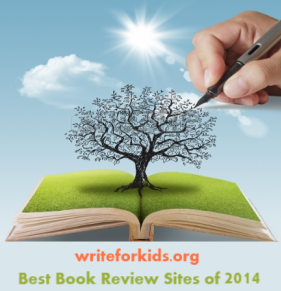 Sisson explains Sagan's theories and work in a clear and concise manner that young readers will understand. Children with an interest in science will be interested in learning about the messages Sagan sent into space on the Voyager mission in an attempt to communicate with other life forms. Two pages of back matter are chock full of source notes, an author's note, bibliography and other notes. In the author's note, Sisson explains that the hardest part of writing the book was figuring out how capture Carl Sagan's many accomplishments. Sisson decided to focus on "how a boy from Bensonhurst, Brooklyn, New York became one of the world's most beloved and recognized scientists." Pair Star Stuff with On a Beam of Light: A Story of Albert Einstein and Look Up! : Henrietta Leavitt, Pioneering Woman Astronomer.